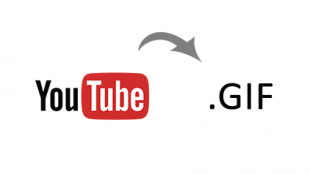 Do you want to convert a chunk of YouTube video to animated gif file? You can do this either by using a Video converter software or by following this easy YouTube to gif method where you don’t required any video software. How to make a gif from a YouTube Video? Open a video to make gif from it on YouTube.com, modify the URL by putting word gif before youtube.com… so this will be looks like this www.gifyoutube.com/… Hit the Enter key from keyboad. This will redirect to gifyoutube.com and load the required video. Use the video slider to find the gif start time. Then choose lenght for the gif animation from the “GIF Length” drop down menu. Finally hit the “Create gif” button to start converting YouTube video to animated gif file. This will take some time to load the video and finally you will have your animated gif file. You can share it on different social websites or even save on your computer. There is another website makeagif.com/youtube-to-gif that you can use to make gif from YouTube videos. This is very similar to above mentioned website, go ahead take a look and use which one you find better.